Leading public sector oil refiner and retailer, Indian Oil Corporation (IOC) has said that it may have to raise petrol prices again, or cut down on supplies. 2011 is an unusual year where the average price of the Indian basket of crude oil has already averaged $110 a barrel so far, against last year's average of $85 a barrel, chairman and managing director, IOC, RS Butola told in an interview given to Hindustan Times. Capital expenditure plans will have to be stopped completely if this is the reaction to the price hikes. He said to the media. If the Government force oil industry to go into losses, supply cuts would be the only remedy, he added. Stating that the other two state-owned oil firms - HPCL and BPCL - have already incurred losses, the IOC chairman hinted at a similar trend for IOC, which is to announce its earnings figures for the second quarter next week. "Our board is meeting on November 9 to take stock of the company's performance… HPCL and BPCL have already announced losses and let me tell you the situation is not looking encouraging at all for IOC as well." He said the finances of the oil companies are stretched. "The government is already spending huge amounts on socialistic schemes and we do not expect them to subsidise us for our losses like last year ,"
Butola said, adding that the only choice now is between maintaining supplies by paying the cost or facing cuts in fuel supplies. Asked why the companies are aggressively expanding their retail presence amidst huge losses, Butola said despite the "unsual situation" that oil companies face this year, oil industry continues to spend Rs 7,000 to 8,000 crore on maintenance and repair as also to keep the brand alive. 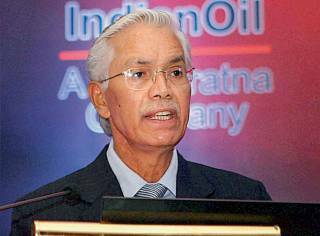 0 Response to "We'll raise Petrol Prices further if needed: Indian Oil Corporation"